This is just a wild guess, as my eyes are very tired, and your pictures won't enlarge. 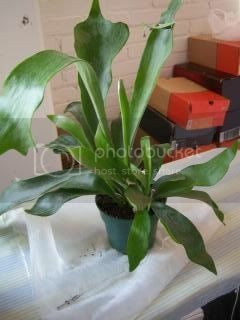 The plant looks like it might be a bromeliad of some sort, although I can't venture to guess exactly which one. It appears, although I can't be positive of it, that there may be 2 plants in the container. Broms typically have leathery, sword-shaped leaves, and it isn't uncommon for the leaves to have wavy edges. Twisted/misshapen tips are sometimes seen on the leaves, also. There are many pictures and descriptions of broms online. You may want to Google bromeliad, and see if you think that might be what you have. Sorry I couldn't be more specific. Perhaps another member will come along and be able to give you exact details. 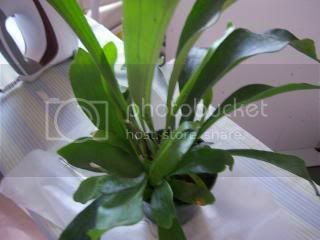 ETA: Looking at it further, it appears as if it wants to be a baby staghorn fern. Maybe I should just cut my losses here and say, "I don't know!" I hope you got some good sleep last night! LOL Thanks for straining your weary eyes for those extra minutes! I think you might be on to something with that staghorn fern deal. I googled some images and found some plants that REALLY look like what I have. I think that the reason that it looks like there are two plants in there is because the plant is entirely to big for the pot that it's in. I have to go locate some potting soil today. They have already pulled it from the shelves at target! Dangit! I don't know where you're located, but if you're in the U.S., you might want to take your new plant to your nearest Extension Service office, and see if they can help you with an ID. 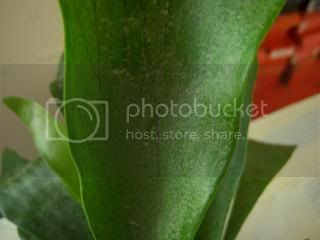 If it does happen to be a staghorn fern, which is an epiphyte, it eventually will want to be mounted on a plaque of tree fern fiber, or perhaps grown in sphagnum moss in a hanging basket. Ahhh.... a staghorn fern! Thats what I was thinking of! Didn't see that posted before though, I was in a hurry to post. As soon as I saw the picture I thought "its a fern" and went to post without really reading ALL the replies.